October 1982 saw the theatrical release of a short stop-motion film by a young apprentice animator at Disney. It ran for two weeks in just one LA cinema, playing with the big screen adaptation of S.E. Hinton’s novel, Tex. That film was Vincent, and the trainee was none other than cult director Tim Burton. Three years out of the California Institute of the Arts, and twenty-four years of age, Burton was given $60,000 by Disney Head of Creative Development, Tom Wilhite, to transform his self-penned poem about a morbidly curious boy, originally intended to be a children’s book, into a short film. Although Burton found working for the studio challenging, his own distinctive style largely at odds with the Disney aesthetic, he found champions in both Wilhite and exec Julie Hickson, who later produced the live action version of Frankenweenie. Ironically, it was that film, the story of a boy who resurrects his dead dog, which saw Burton fired from the studio, only for it to be remade as a critically acclaimed stop motion feature for Disney in 2012. Vincent can certainly be seen as a precursor to the animated version of Frankenweenie. Indeed, the eponymous seven-year old boy experiments on his dog, Abercrombie, in the hope of turning him into a pet zombie. Stylistically, there are many similarities too – the juxtaposition of nice suburban homes and B-movie horror subject matter, the shock-headed, hollow-eyed appearance of the child protagonists Vincent and Victor, and the chiaroscuro shadows and monochrome pallete which seem to have their roots in German Expressionism. Vincent is named after the film’s narrator and a big hero of Burton’s, Vincent Price, whom the character aspires to emulate. We meet him playing a mournful version of The Streets of Cairo, or the Poor Little Country Maid on a recorder, before imagining himself with a pencil moustache and pipe, living in a mansion filled with spiders and bats. Vincent is a polite young man, but while he is courteous to his aunt’s face, he secretly imagines dipping her in hot wax and putting her in a gruesome museum, like in the 1953 Vincent Price film, House of Wax. Young Vincent and his movie star idol are also linked by the work of Edgar Allen Poe. Price famously starred in adaptations such as The Fall of the House of Usher, The Pit and the Pendulum, and The Masque of the Red Death, his animated namesake claims Poe as his favourite author. Vincent is plagued by vivid fantasies straight out of Poe’s stories. Burton’s own poem is in the form of rhyming couplets, much like The Raven, which young Vincent quotes at the end of the film. It is one of Poe’s recurring themes, that of premature burial, which pushes young Vincent over the edge. He begins to imagine he has a beautiful young wife who has been interred and screams to him from under the ground. This is reminiscent of Berenice or Madeline in The Fall of the House of Usher. Vincent digs up his mother’s flowerbed to free his spectral love, and gets himself confined to his room, where his fevered reverie develops into full blown-terror. Once alone, Vincent begins to hallucinate all kinds of horrors, much like the unhappy murderer of The Tell-Tale Heart or Lenore’s grieving lover inThe Raven. He believes his bedroom a tomb, a cursed place that won’t let him leave, just like theHouse of Usher. While the overall tone of the short is tongue-in-cheek, with Vincent’s mother reminding him he is just a normal seven year old boy and telling him to go out in the sun and play, there is an undercurrent of real horror as our little hero sinks to the ground in the final frames, unable to raise his voice above a whisper and quotes the closing lines of The Raven, implying he has sunk too far into self-fuelled insanity and despair to ever recover. While Disney may not have known what to do with this little gem beyond its short-lived theatrical release in ’82, it’s clear that Vincent is an amuse-bouche that alerted Hollywood to the young director’s unique vision. It seems to me a little seed from which sprouted some of my all time favourite full-length features: The Nightmare Before Christmas, The Corpse Bride, Edward Scissorhands, Sleepy Hollow and Frankenweenie. 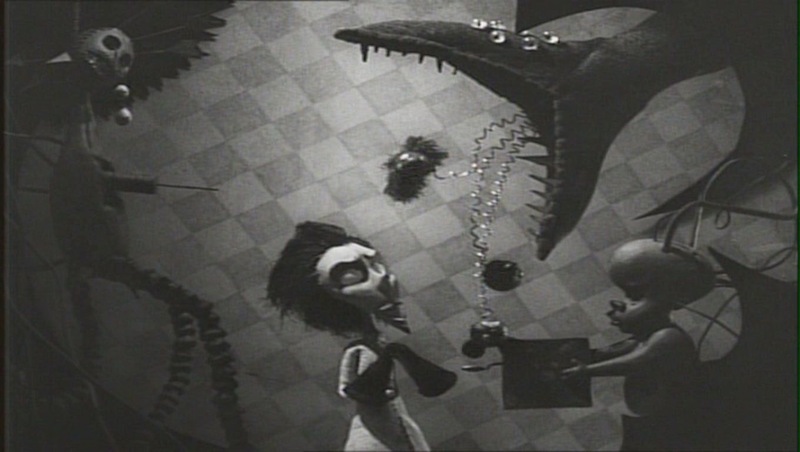 In fact, if you look closely, you can even see a brief cameo from Jack Skellington in an early incarnation. Poe, Burton, and Price. Three stalwarts of Halloween entertainment. Do yourself a favour and watch this beautiful little film from a fledgling genius now! This entry was posted in Uncategorized and tagged Disney, edgar allen poe, film, review, the raven, tim burton, vincent, vincent price. Bookmark the permalink.